My late father was born and raised in Galesburg, Illinois, a historical smallish railroad town. Most of his family still lives there, and I have wonderful memories of visiting there on various Christmases, Thanksgivings, and summer vacations. I've been to Galesburg alot, at least once a year since I was a baby. However, as far as knowing the town itself, I was lacking. It makes sense, we went up there to see family, and my Nonna is an amazing cook and baker, so we rarely went out to eat. Last week I had a week's worth of vacation days booked, with no plans of what to do. So I decided I would go on a solo road trip to Galesburg, and this time I was determined to explore the town... learn it's history, eat it's food, admire it's quirks. 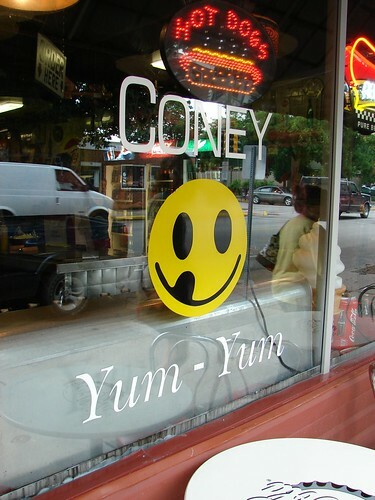 For lunch one day, my aunt took us to Coney Island Dog, the oldest restaurant in Galesburg. 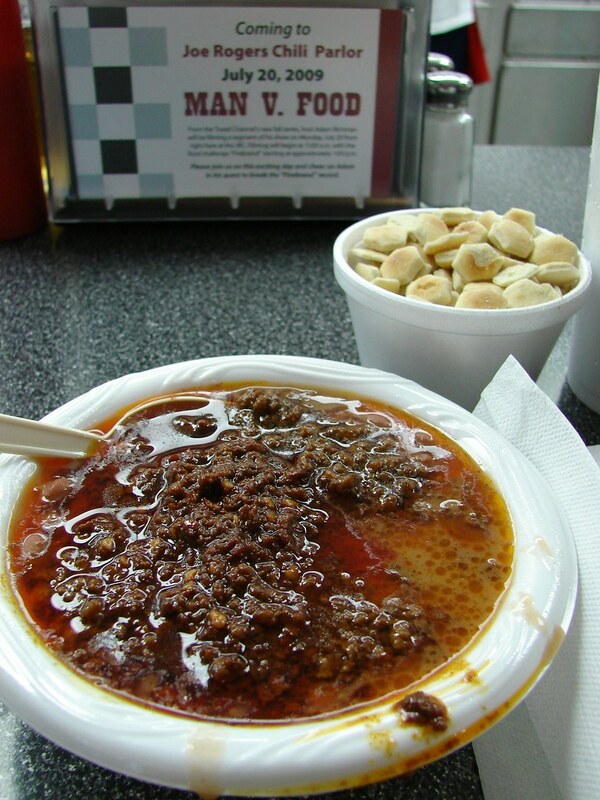 It was established in 1921, the recipe for the Coney sauce being passed from owner to owner for generations. It's a small-ish storefront place, with a long old counter, with worn wooden stools and plenty of antique kitsch decorations. If you look up you will see clouds cut out of peg board. Behind the counter there all lots of old and new collectible coke bottles, and many other nostalgic knick-knacks (all kept clean and dust free, we noted). 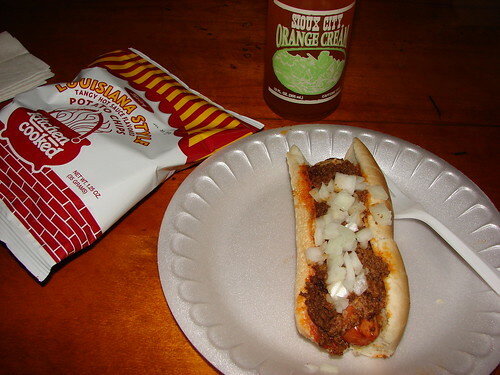 We all got the Coney dog, which is the classic... a dog covered with a meaty sauce, more bland than chili, spicy mustard and onions. 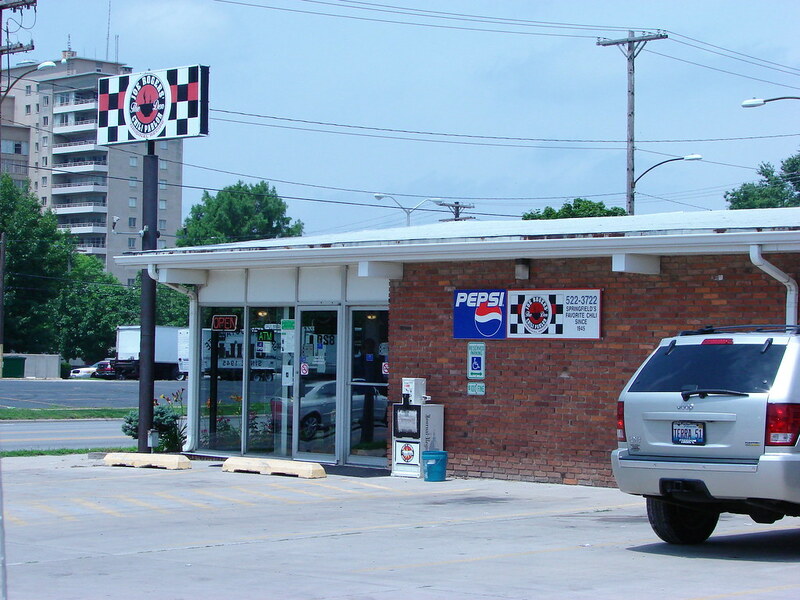 They have a selection of locally-made potato chips and a fridge full of sodas in glass bottles. They have several dogs on the menu, including a Chicago dog and one called the "Mud Puppy," mud being a cheese and meat sauce... much like you'd put on those little rye bread party pizzas. But for my first time, I stuck with the classic. Like I said it was a little bland, but it was good, and being there gave me such a good feeling. It was friendly and fun and just plain adorable, frankly. I think I will visit every time I'm in town. 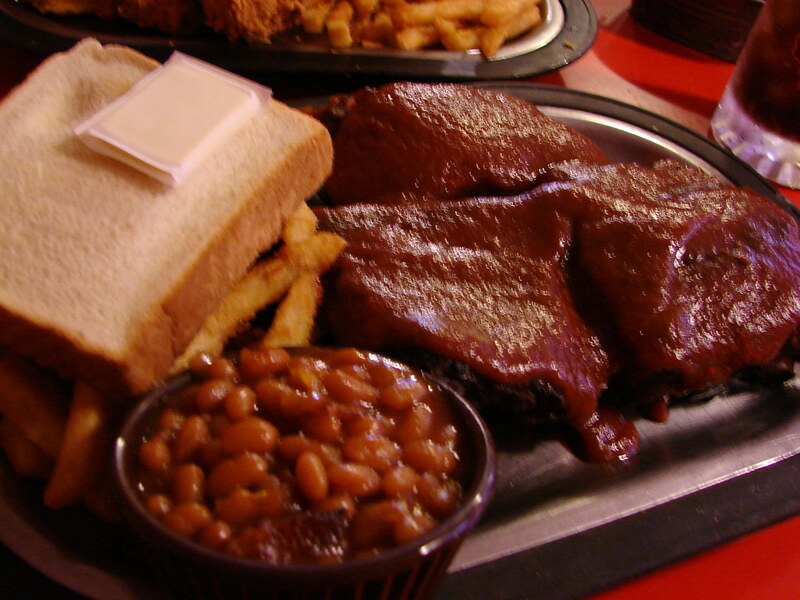 The same day I had Coney Dog for Lunch, I went to The Rib Shack for dinner. I was very excited about this place, as I had passed it over the years and admired the sign outside... a large very pink neon pig in a chef's hat. Who doesn't love Anthropomorphic Cannibalism? I mean really. So my cousin and I went. My Cousin has lived there for 12 years and had never eaten at the Rib Shack! I was shocked by this. Her dad, my uncle, of course, had hung out there lots in high-school. It has been there since 1952! A small, squat red wooden building. Inside there are a row of picnic tables, and lots of old easily-wiped down booths with laquered wooden tables. All the tables have a roll of paper towels on a pig-shaped paper towel holder, and a little pail for discarding dirty napkins, etc. 2 waitresses took care of business, yelling to the kitchen and to each other and keeping things moving. After we ordered, the first thing they brought out was a tiny metal trough of water, for aiding in sticky-hand clean up. I ordered the rib platter and my cousin ordered the fried chicken, and we planned out sharing so we could taste thier 2 most favorite dishes. We were told the chicken takes a half hour, so would we like to order some onion rings for while we wait? Heck yes! 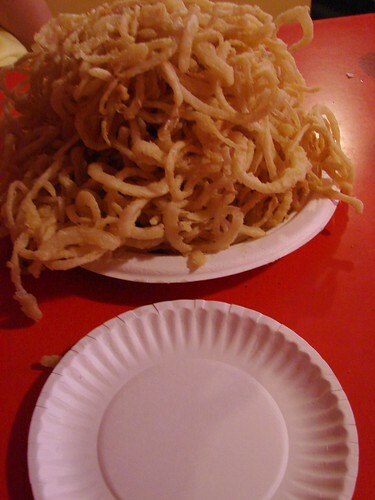 And man, they were some Gooood onion rings... thinly sliced onions lightly battered and fried. A whole giant haystack of them! Then our entree's came out... ridiculously large portions of meat and fried stuff. The french fries are AMAZING. the beans are okay... I mean they were quite sweet and they had bacon in them, so there you go. The Texas toast was completely unecessary, but I loved that it was there, perched atop our giant piles of food just because. The ribs were awesome. 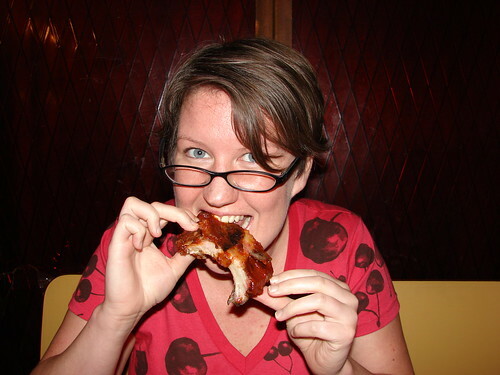 They came right off the bone, but weren't so tender they were soggy-feeling. And they had a nice smoke flavor and rally yummy BBQ sauce. 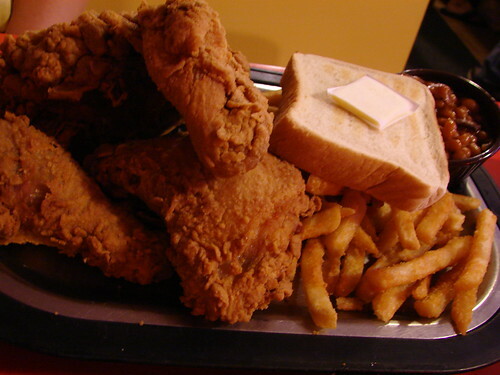 The fried chicken was some of the best I've ever had, too (though admittedly I don't have much experience with fried chicken outside the typical KFC and the occasional home made stuff). 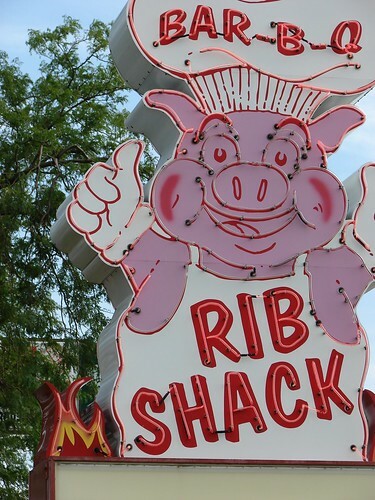 Everything about the Rib Shack was what the big neon pig had promised me; good food, quirky, homey atmosphere, fun. I bought a mug, and hope to go back enough times to collect an entire set including the pitcher. What? I love that damn piggy! On the way home from my trip, I stopped in Springfield, Il for lunch. I had used roadfood.com to look for interesting places, and decided on Joe Roger's Chili Parlor. It just looked like the kind of road joint one could feel comfortable eating alone. I got a bit nervous on the way there, though... a single girl in a tiny rental car driving through an iffy neighborhood... but I kept going, figuring that the shabby-looking neighborhood could very possibly mean better food. The parlor actually is located in a very industrial area, and the parking lot was full. I went in and sat at the counter near the cash register and ordered a medium-hot bowl of chili. It came almost right away, along with a generous separate cup of oyster crackers. I was a bit surprised by the chili. It was basically a pile of finely ground meat with a few beans, surrounded by reddish oil. The oil, apparently is where a lot of the flavor comes from. Since I sat near the register, I got to hear other people order.... kind of a glimpse into what the locals do. 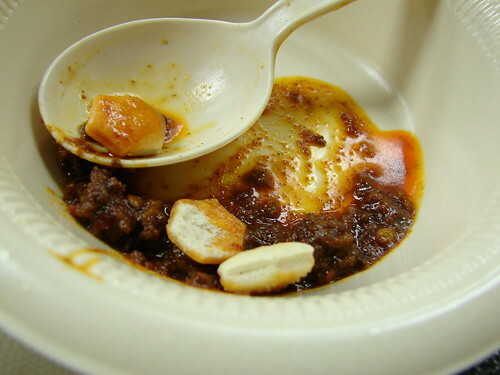 Some ordered extra oil and some ordered their chili "with a touch" meaning very little oil. Now I know! There were signs placed in the napkin holders and on the door advertising the fact that Man Vs. Food will be filming there next week! I asked the cashier what his challenge would be. Apparently he has to beat the record number of bowls of their Firebrand chili, the hottest they have, which is 4. So Adam is going to try to down 5 bowls of Firebrand chili. My medium-hot chili had some heat to it...I finished the bowl no problem, but it did make my eyebrows sweat and left a constant tingle in my lips. So I asked if I could try just a bit of this famous Firebrand. It was tastier than the medium-hot, I thought! Hotter yes, but it had a distinct dried-chili pepper flavor that was yummy. I don't know if I could eat a whole bowl, but I'd like to try, because if you do, you can write your name on one of the wall posters they have covering the walls. I have goals, people. This was a great great trip for me. Not only all the fantastic eats I got to experience (and they all were EXPERIENCES in eating for sure! ), but I got to learn about my daddy's hometown, get a glimpse of where and how he grew up. I also got to learn about some history... Galesburg is where the 5th Lincoln/Douglas Debates were held, and poet Carl Sandburg was born there, as was the inventor of the Ferris wheel. So much history there. And for me, family! Solo road trips are great because I could stop on a whim at quirky antique malls, scary truck stops and park-like rest stops. The photo above is a new addition to one of my favorite stops, the Pink Elephant Antique Mall in Livingston, IL. 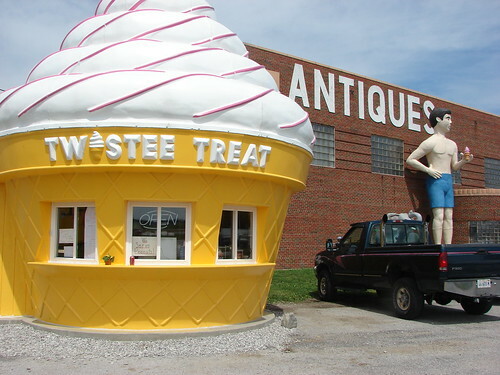 I'm used to seeing the giant guy in blue shorts ("Beach Guy") and the big pink elephant, but this ice-cream shaped ice cream stand? Fantastic and new! Notice that they even gave the Beach Guy his own Twistee Cone!! A car, a small amount of spending cash, a camera, and a sense of adventure. AWESOME vacation. I love your trip Stephanie! You are so brave going on a road trip alone... So fantastic! I'd love to go to Galesburg someday. You've always made it sound cool, and I have some friends who went to Knox and they have good stories. I'm glad you had such a great vacation! april, thanks! I don't know if it makes me brave, but it sure was a blast! what can I say? I like people and places! You should go as part of your next tour de Mo/Il! mike, yeah... it wasn't pretty. It tasted good, but yeesh... so much oil! Gotta order the Joe Rogers (nee Den Chilli) without the friggin oil. 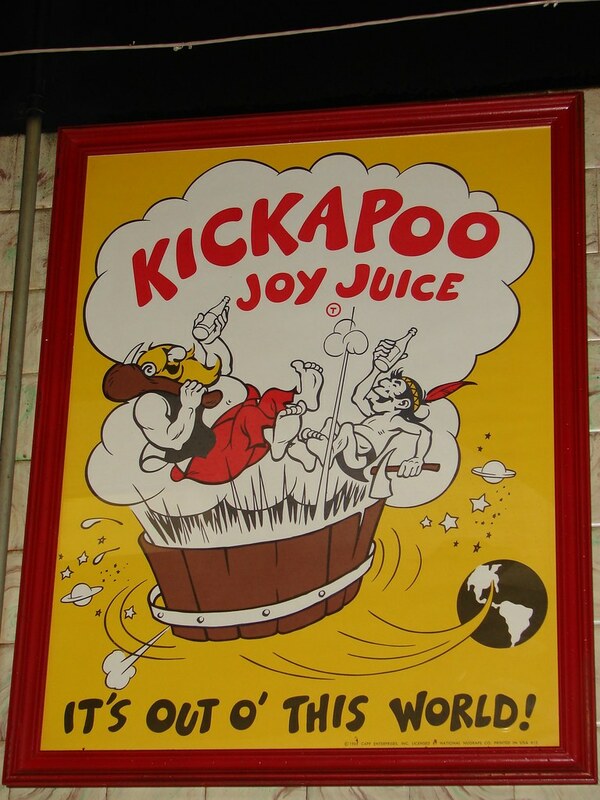 So gross, though the old folks like my grandpa loved that stuff. And chilli is spelled with 2 "l's" in Springfield. I don't know why. Good choice. Joe Rogers! With a touch! FOR THE WIN! That's one of my favorite spots but I have to be ensured that I'm going to be alone for the rest of the evening if you know what I mean. You foodies take the best pictures! Sounds like a wonderful road trip!